Following a noisy night parked near the nightclub we slowly got up and packed away ready to drive to Tallinn. Today would be our final different Country border as we crossed in to Estonia. 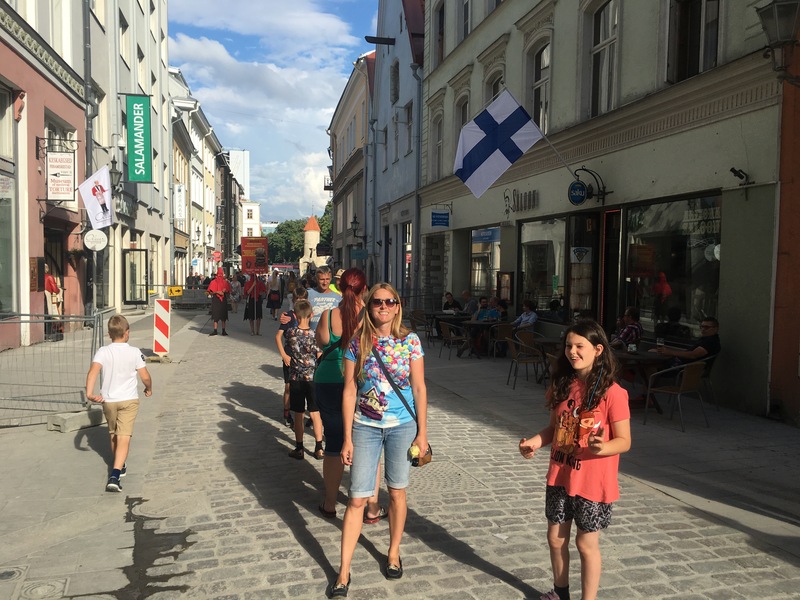 We had planned to stop off for a night at another beach location in Estonia but instead we decided Tallinn looked more fun and wasn’t too much further. The drive to Estonia was ok, a single carriageway road again for miles and miles saw us stick to a steady speed and nearly got us the whole way with no traffic. 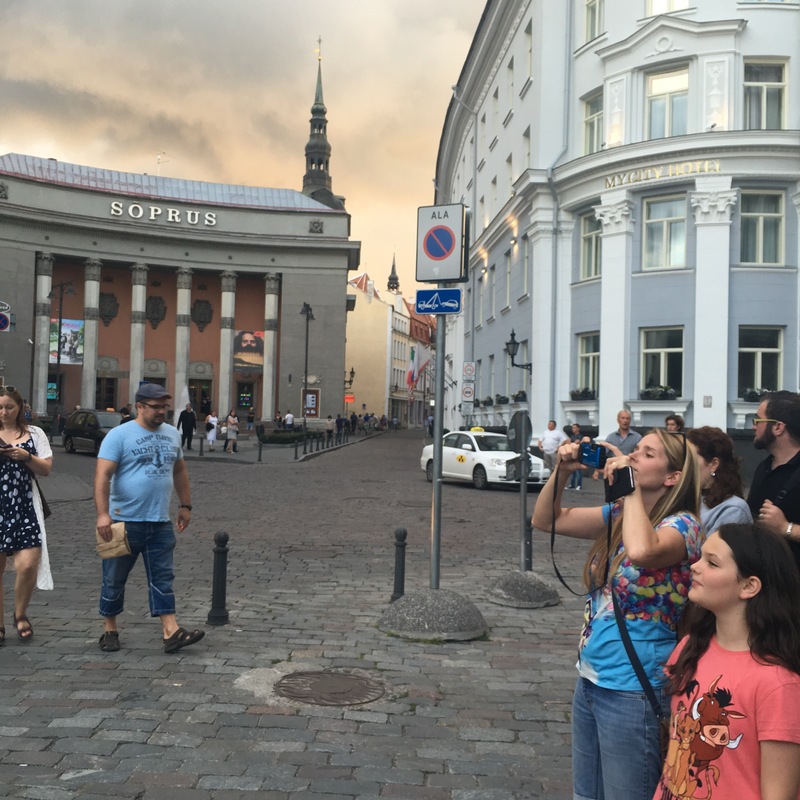 As we approached our stopover in Tallinn marina traffic became heavy and we got taken into a contraflow as one side of the road was closed. For a few miles the entire road was closed with no obvious reason, then we saw it… A massive bicycle race was taking place. Marshals luckily allowed us to cross the track during a gap in the bikes, we had feared the entrance was blocked. The marina was a nice campsite, again large pitches with electric. For the first time in days we spotted a fellow British Motorhome and Neil had a chat as he looked for the water point. 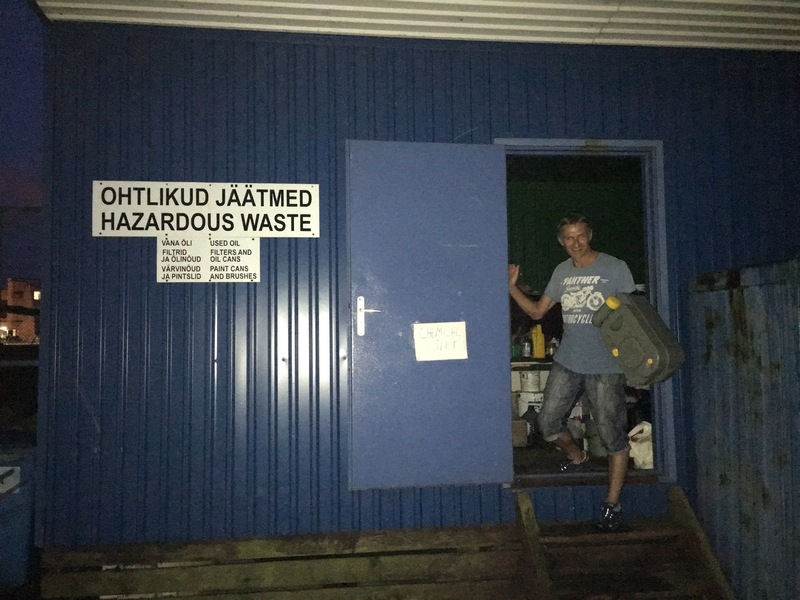 I also made a friend when I went into the reception office to ask for info on how to get to get to the old town, the slightly odd (geek looking) Estonian man gave me directions but then said if I waited for him to finish his shift he’d be happy to take me! I politely declined his offer as said my husband is good with a map! We managed to locate the bus stop and jumped on board a very full bus heading to the town, we all gasped when Vickey asked for 8 tickets and the driver advised it was €60, luckily his translation was wrong and he meant €16. With standing room only we ended up dotted round the bus standing wherever you were lucky enough to have something to hold on to. It was Vickey’s turn to make a friend on the bus, she chatted to a very friendly young Canadian chap who was heading to Russia to visit his Grandma. He told Vickey he was going now as he is still 17, if he went after he turned 18 he would have to serve in their military. 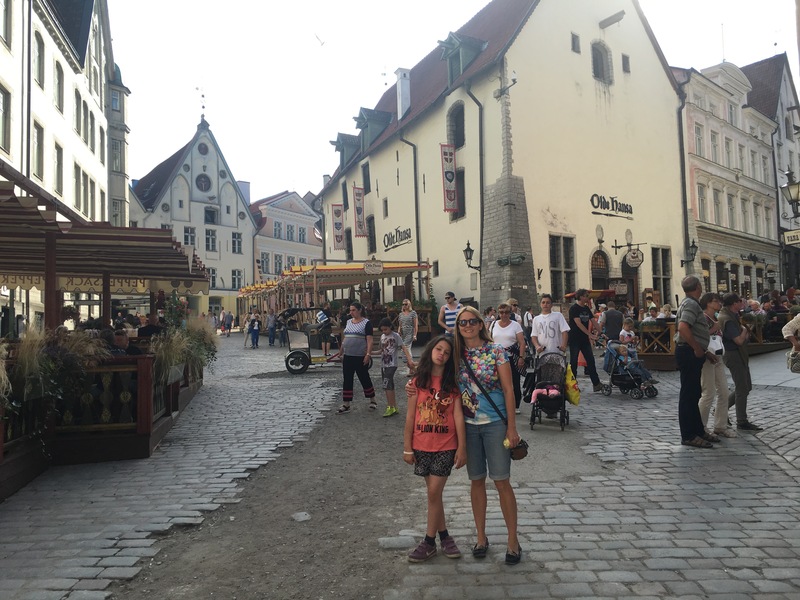 Tallinn certainly didn’t disappoint and was unlike any capital city we had ever been to before. 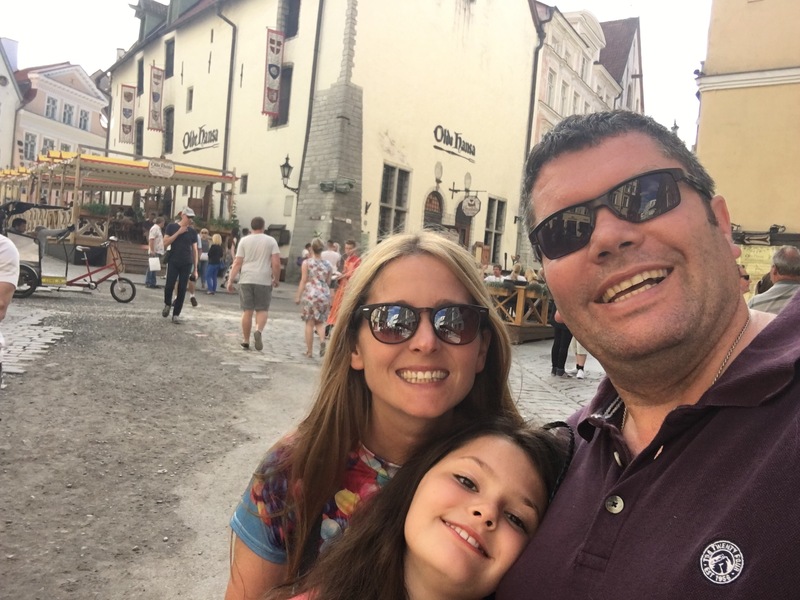 We got off the bus in a busy built up shopping area but literally a stone throw away from the old town which could not have been more different. The streets were full of people in costume and the shops and other buildings felt quite surreal. It had a Disneyland feel to the whole place. There we plenty of photo opportunities everywhere you looked and loads of tat shops, I was in heaven. As usual with 8 of us moving around together it was no surprise when someone announced they needed the rest room. We bundled into a Brewery which claimed to sell beer from every country in the world. It was really nice and their drinks menu was huge, I went safe and went for a Stella, Neil and Vickey opted for a Heineken which came out cloudy and Michael asked for anything Estonian, mine was the nicest by far. We walked round the old town taking photos and looking like tourists till we found the most German Irish pub ever. The pub was called The Dubliner and looked very Irish but then had a beer cellar which felt like you entered Germany. We all ordered German food and drink and had a lovely dinner. It felt really strange leaving the beer cellar at 9pm, as we walked up the steep stairs to leave it was daylight and felt like the middle of the day. We opted to taxi back to the vans as the bus journey there hadn’t been the most enjoyable and Tallinn had heaps of taxis all queued up on every street. We again had a very friendly taxi driver who talked the whole journey, it was quite like a guided tour. He explained the marina complex we were staying at was built for the Moscow Olympics and was where the sailors were based. He also told us he served in the Russian army from 1982 to 1984 he had a lot to say. We were soooo lucky to get back to our vans just as thunder was heard, within minutes of getting in and getting our washing off the airers it was pouring with torrential rain. From our van we could see a huge TV tower which we had seen adverts for in the town. We decided tomorrow we would go up the tower before leaving.